My school bus stop was over a mile away from my house. We used to walk in a group to the bus stop to catch the bus. The early morning walks through the serene landscape were therapeutic. The rising sun with crimson orange rays gazing the wet blades of the grass, the heavy clouds of fog trying to sediment over the rice fields, the flock of tiny sparrows flying over the fields to get a little scoop of grains, the little ducklings following their mom in the clear stream by the side of the road were some of the aesthetics of the landscape we enjoyed on our way to the bus stop. The walk back to home from the bus stop was always faster; it was more like a run to escape the heat from the afternoon sun to quench the thirst and hunger. Most of the time when I come back home, the house will be filled with the aroma of freshly fried banana fritters or lentil fritters. Occasionally the strong smell of dry roasted spices makes its way to us at least few blocks away from home. Chili powder and Coriander powder were made in big batches with the help of others. Other strong spice blends were made by my mom. No spice blends or curry powders were bought from store. The dry spices were bought from the market, cleaned, sun dried, dry roasted and finally grounded and stored. The aroma of the homemade spice blends were so strong that their aroma lingers in the house for at least couple of days. 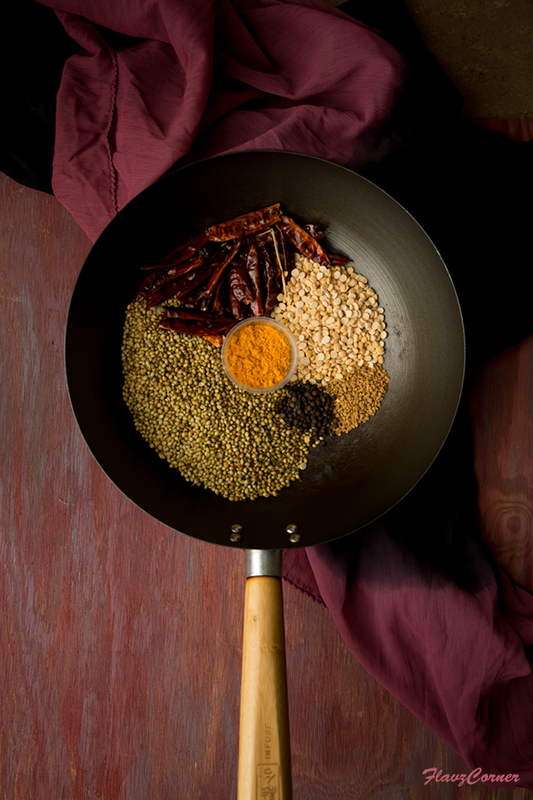 The freshness and goodness of homemade spice blends could never be replicated in a store bought curry powder. Recently I decided to give a try on some of the spice blends and here I am with the sambar powder. I made only a small batch to test the freshness and taste difference. I was really impressed how it tasted in the sambar and thought to share with you. Its far way better than the store bought preservatives loaded spice blends. Lately there were some allegations on some of the leading brands of spices for adulteration. If we can make all these at home why bother to spend money on a chemical filled product. 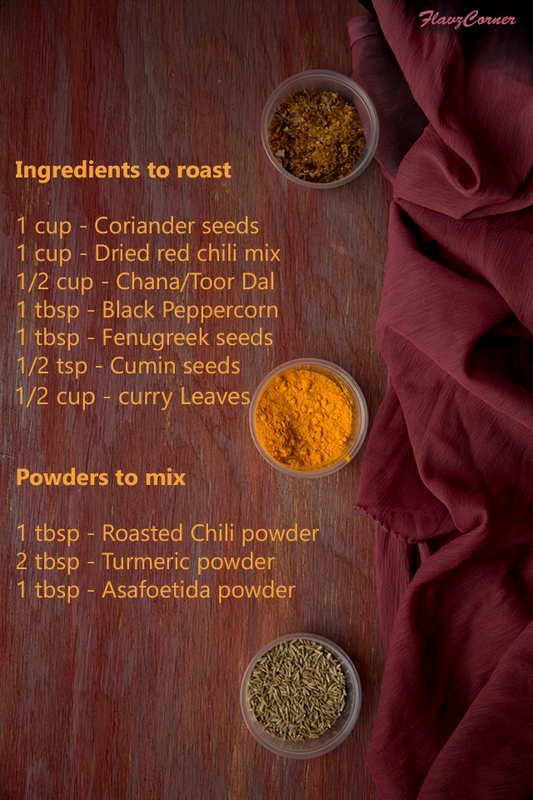 I think that’s ample enough reasons to start making your own spice blends. 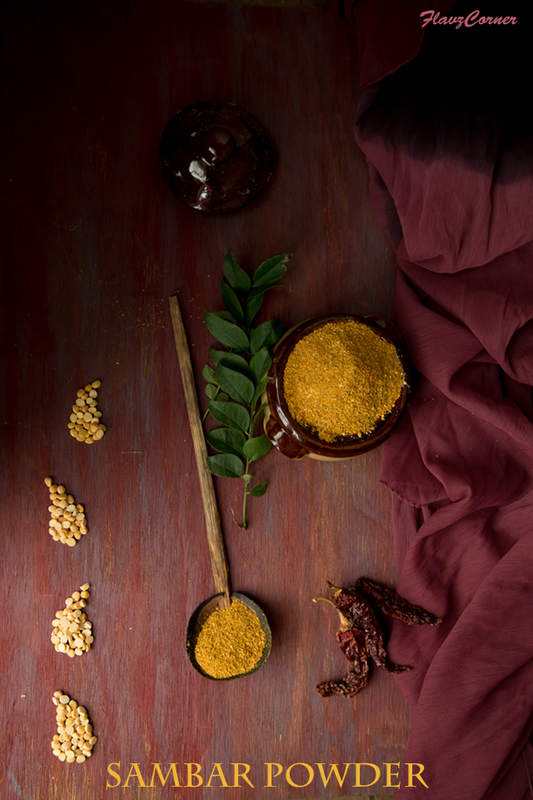 Give this sambar powder recipe a try and let me know how it turns out for you. Dry roast coriander seeds, chana daal and chili separately till the roasted aroma comes in a wok. Dry roast cumin seeds, fenugreek seeds, peppercorns and curry leaves together on low flame till the curry leaves are roasted well. Roast the kashmiri powder on low heat for 2 minutes till the raw smell is gone. Let all the ingredients cool down completely. Grind the spices into a fine powder. Finally mix the turmeric powder, Kashmiri chili powder and asafoetida powder to it. Store the sambar powder in a labeled air tight container. I didn't know that you can add lentils to the spice mix. Gotta give this a try! The sambar powder looks perfect. I remember my mom making it while we were kids because we couldn't source the kerala sambar powder at the place where we lived. And that aroma was just awesome. I too made it some time back and we just loved it because we know its pure and what goes into it unlike the store bought ones. I sometimes make spice blends -- they do taste fresher and usually have much deeper flavor. Sambar powder is good stuff -- haven't used that in years. Need to again. :-) Good post -- thanks.